I take a strange pleasure in being associated, no matter how vicariously, with the greatest novelist in the English language. I am by no means sure that she would approve of this event. Asked about God, Immortality and Duty - strange topics of conversation to be raised during an afternoon's stroll - 'she pronounced with terrible earnestness how inconceivable was the first, how unbelievable the second and how peremptory and absolute the third'. But there she is in black, polished marble on the floor of Westminster Abbey - the junkyard of the nation's vanities. She keeps appropriate company, in a row of four disparate pagans. George Eliot would not have enjoyed a night out with Dylan Thomas; and Lord Byron and W. H. Auden - who occupy the flanks of the forward line - had little socially in common. But, in their different times and ways, they all defied respectable convention. 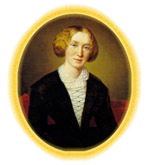 George Eliot, having established her personal morality, lived without the slightest deviation from its precepts. If Westminster Abbey is a temple of virtue, as distinct from established Christianity, there is no one who has a greater right to be remembered in Poets' Corner. Over her left shoulder there is a memorial to Henry lames. A critic, whose name I no longer recall, said that his work could be divided into three periods - lames I, lames 11 and the Old Pretender. In 1878, he visited George Eliot in Surrey and, at the end of an unsatisfactory afternoon, was bidding her partner, George Henry Lewes, goodbye when he was asked a favour. Would he dispose of an unwanted book that a neighbour had brought round earlier in the week? It was The American, a novel from the literary reign of lames I. George Eliot had not connected the author with her visitor. She simply did not like that sort of fiction and saw no reason to pretend otherwise.